Like many parents and educators, I have been a witness on how scrupulous it is to pass a bill for it to become a law. I'm not a politician nor a lawyer so I wouldn't dare go beyond explaining the long procedure by which the lawmakers in the Philippine Legislature abide by. All I know is that a series of reports, conferences and debates have to be made, and that it is important to know that it should be beneficial to all the citizens. I have been a witness indeed to a far more important bill or law wherein my children's future are at stake. And I'm pleased to announce that finally President Benigno Aquino III has signed the Republic Act No. 10533 or the Enhanced Basic Education Act of 2013 commonly known as K to 12. ...when K to 12 was then K + 12 and the Department of Education was pushing for the Universal Kindergarten. At that time, I was still teaching Pre-schoolers and handling our church's children's ministry. 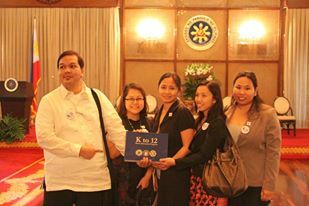 ...when K to 12 was formally launched at Malacanang Palace. I was there too! 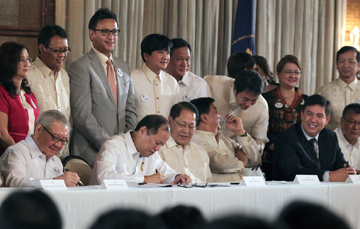 ...when P-Noy, joined by the legislators from the House of Representative (The Congress), signed the bill yesterday. It was a blessing indeed to have the opportunity to see first-hand a part of the history being made. K to 12 stands for Kindergarten plus 12 years of basic education. This aims to qualify students in our country to become responsive to global educational standards. The law – which introduces two additional years in secondary education and makes Kindergarten mandatory among 5-year olds – is expected to give graduates better choices in the field of work or further education. 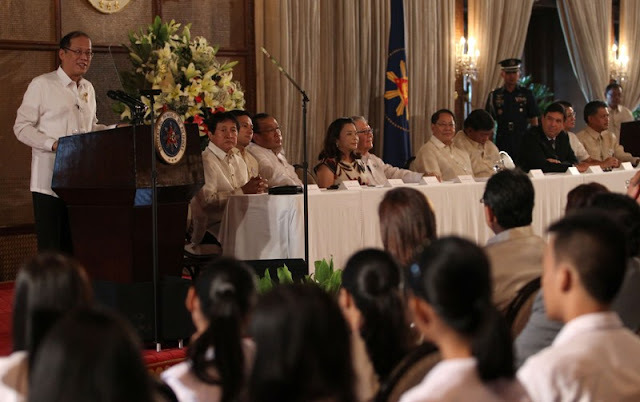 Like what PNoy said in his speech, in the event of the enactment, “[Sa K-12] tinitiyak nating sapat at kapaki-pakinabang ang kasanayang naibabahagi sa ating mga mag-aaral.” ([With K-12] we are making sure that adequate and useful skills are being imparted to our students.) The additional two years after fourth year high school are intended to further hone the skills and talents of students for their chosen career path in arts and sports, technical vocational, entrepreneurship or tertiary education. This was indeed the time that the Department of Education have been awaiting and was a momentous time for the head of the department, Education Secretary Br. Armin A. Luistro, FSC. “We are particularly grateful to the members of Congress, government agencies, the working groups, and other individuals who share with us the vision of a relevant, responsive and truly 21st century education.” That was a bit of his speech as he was expressing his gratitude to everyone who made this possible. I think that the more important thing than the k-12 education is increasing the salaries of public teachers and providing better curriculum for the existing school standards of Philippine institutions. Public school teachers now enjoy increasing compensation, from their starting salary of PhP12,026, last 2008 to at least PhP18,549 monthly as of this year, showing the value our government places in what is possibly the noblest of professions. The best for the teachers are still coming. The teachers, particularly in the public school, are considered as unsung heroes. They work so hard, but being underpaid. Now their salaries are gradually being standardized as indirect way of motivating them to fully implement the educational reforms and K to 12 is one of these. Hope this will go a long, long way till its fruition. I believe so! Undoubtedly, our teachers are our new age heroes! I just visited your blog post on this as well! other places. If in case you don't take action immediately, customers may put all your child's safety at risk. and in adding up increases security. Well this is great news. But the only question here is do we have enough facilities and teachers for this educational upgrade? Are we ready for this? I would congratulate you for being part of history in making that K 12 system happen but I wish that an extensive study was made before that was passed - not just passing it because it is what other countries are using. This is the problems lots of individuals are going for schooling workouts provided all by MMA. Assist you to figure out your midterm and additionally short term your goals. I am not updated with the curriculum in the Philippines now but I hope that the K-12 will really helps our children to get ready in college. So, are your children in 9th-12th grade has advance subjects in preparation with college or are there any subjects that will be credited to college? I think signing K-12 is a very promising move. There's literally a huge number of students that get shot out of high school that struggle in college. On the other hand, as many have pointed out, the problem is how the government will answer the eventual need for more structures and teachers. As someone who grew up in the US, as a parent of a teen, and as an educator, I am very happy with this development. There's a HUGE difference in maturity between a 16 year old and an 18 year old. Many parents may not like the K-12, but I love it. My son will get to experience this program because he is just in preschool year. I am just hopeful K-12 will truly help improve our education program, such our kids will become more competitive. uneven or boldly bracelets has a accents. Hi Ate Joy! It's been quite some time. You're really a super mom. Super in the kitchen, super blogger and a super advocate. I really admire you because you are really supportive of such a noble cause. God bless the Philippines and our little kids! I'm really happy about this development! :) I'm proud that Br. Armin's vision has come to pass - he's been an amazing mentor to both myself personally and the Lasallian community as a whole and we are glad of this change he (along with many others) has instituted in our education.